Long axial length and anteroposterior stretching of the eyeball are mostly responsible for the changes seen in pathological myopia. A few studies have evaluated the changes in ocular shapes among emmetropes and myopes. The stretching may be global (uniform expansion of the entire vitreous chamber), equatorial (peripheral expansion parallel to the visual axis), or may be limited to the posterior pole. The axial elongation (length) has been found to be comparatively higher than the corresponding increase in height and width of the globe., Hence, axial length ideally determines the size of the globe. But certain exceptions do exist. We report a rare case of myopia with rhegmatogenous retinal detachment, in which the equatorial diameter was relatively higher than the axial length. The discussion deals with this rare presentation and the intraoperative difficulties caused by the same. A 46-year-old female presented with complaints of sudden painless diminution of vision in the right eye for past 7 days. A shower of floaters preceded the drop in visual acuity. At presentation, the patient had a best-corrected visual acuity (BCVA) of 20/200 in the right eye (RE) and 20/20 in the left eye (LE). The refractive prescription was noted to be RE: −1.5 (spherical diopter) DS/−1 (cylindrical diopter) DC@80°, LE: −2.5 DS/−0.5 DC@110°. The right eye revealed a temporal, fresh rhegmatogenous retinal detachment involving the macula. Marked peripheral chorioretinal atrophy was evident [Figure 1]a. The causative break could not be identified. Left eye fundus examination showed a sharp foveal reflex with a normal looking posterior pole. 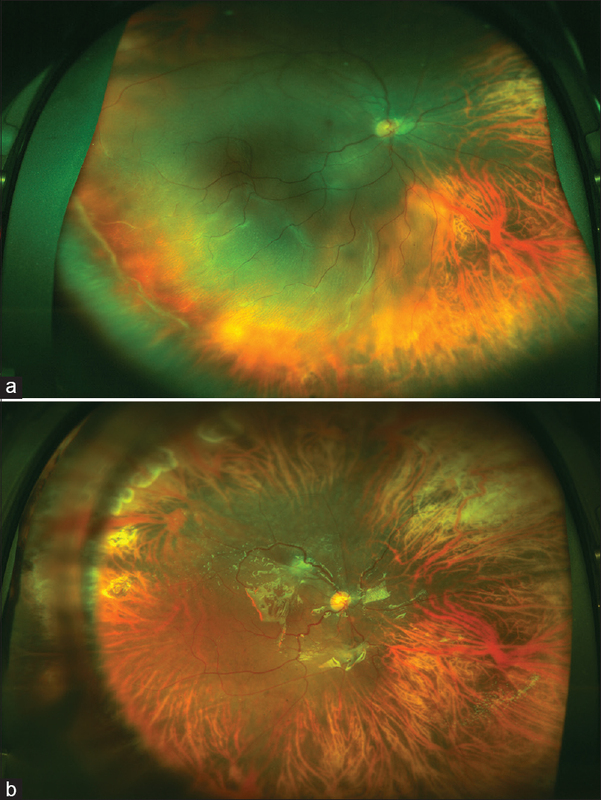 However, severe chorioretinal atrophy was noted in the peripheral retina around the vortex veins [Figure 2]a. The axial length measure by A-scan biometry was 24.51 mm in the right eye and 24.71 mm in the left eye. 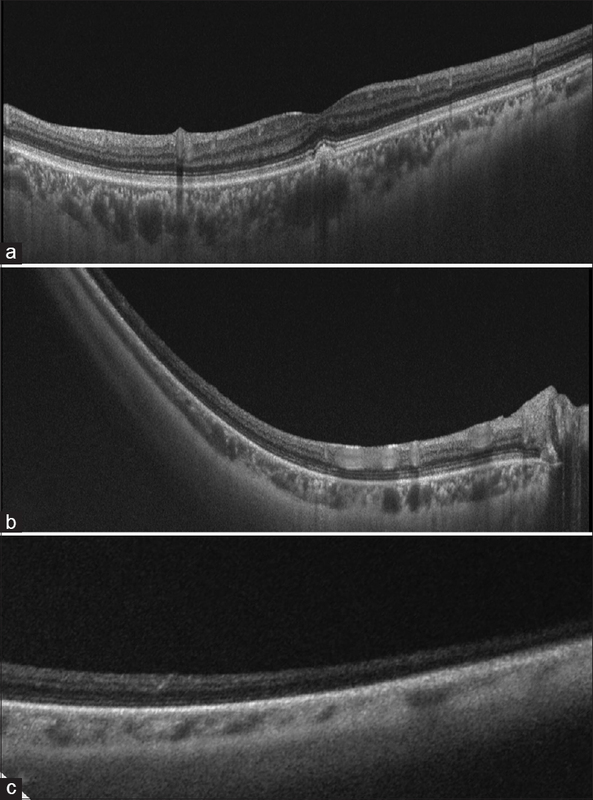 Swept source optical coherence tomography (OCT) (Topcon DRI OCT-1 Atlantis, Topcon Corp, Tokyo, Japan) of the left eye revealed a central macular thickness of 251 μm and a central choroidal thickness of 310 μm with the peripheral scans showing chorioretinal thinning [Figure 3]. Ultrawide field fundus autofluorescence of the left eye showed peripheral hypo-autofluorescence [Figure 2]b. The patient underwent right eye phacoemulsification with posterior chamber – intraocular lens (19.5 D) implantation in the capsular bag followed by 23 gauge pars plana vitrectomy with 360° endolaser and silicon oil injection. Intraoperatively, there was difficulty in maneuvering the standard 23 gauge vitreous cutter to the periphery for removal of the peripheral vitreous. The break could not be identified. Hence, 360° endolaser was done. However, adequate laser marks could not be obtained in the periphery, which was then made possible after increasing the laser power. At the end of the surgery, around 7.3 ml of silicon oil was injected. On postoperative day 1, the retina was attached [Figure 1]b and the BCVA was 20/100. 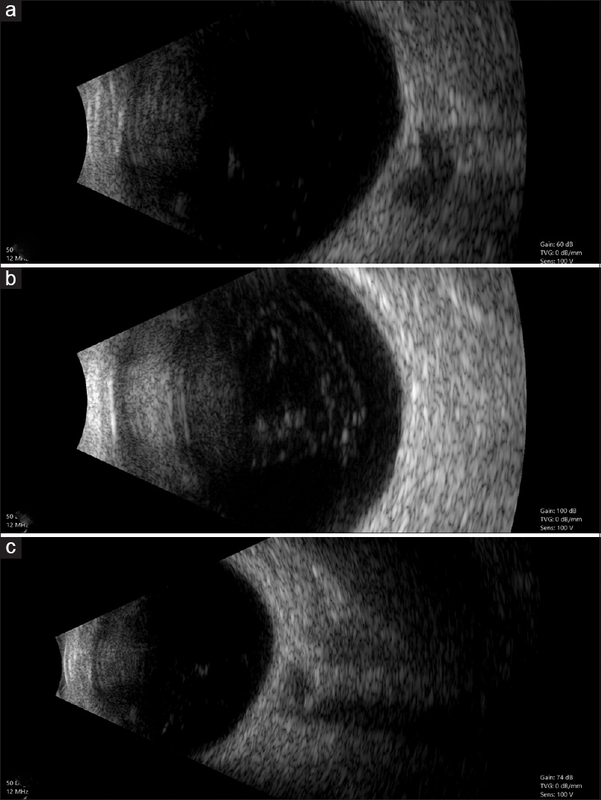 Ocular ultrasonography (USG) of the fellow eye showed an elliptical globe with a longer oblique axis of 26.1 mm [Figure 4]. Eyeball shapes have been studied using ocular USG and magnetic resonance imaging., A study by Vohra et al. using USG supports the concept that anteroposterior length increases 3 times more when compared to the width. Hence, the enlargement and stretching mostly occurs parallel to the visual axis (equatorial). This might logically explain the incidence of posterior pole fundus changes like myopic macular hole, myopic tractional maculopathy (MTM), myopic choroidal neovascular membrane (CNVM), and equatorial lattices in pathological myopes. Second, the elongation may be limited to only the posterior pole causing a focal posterior staphyloma. This might similarly lead to MTM, mac hole, and CNVM. The third variety in literature involves global expansion akin unanimous enlargement in the height, width, and length. Atchison et al. in their large-scale study further noted that the height increases more than the width. The differential growth, that is, the tendency to elongate more in anteroposterior length followed by height followed by width, may be due to the disparity in the orbital volume or the regional variability in the eyes susceptibility to a factor that causes orbital expansion. Oblateness indicates the change in a shape of spheroid body when compared to a sphere. An oblate body has an increased equatorial diameter when compared to pole-to-pole diameter. Humans tend to be born with eyes, which are oblate. Emmetropization causes an increase in axial length with age finally achieving a spherical to prolate (axial length greater than equatorial diameter) contour. 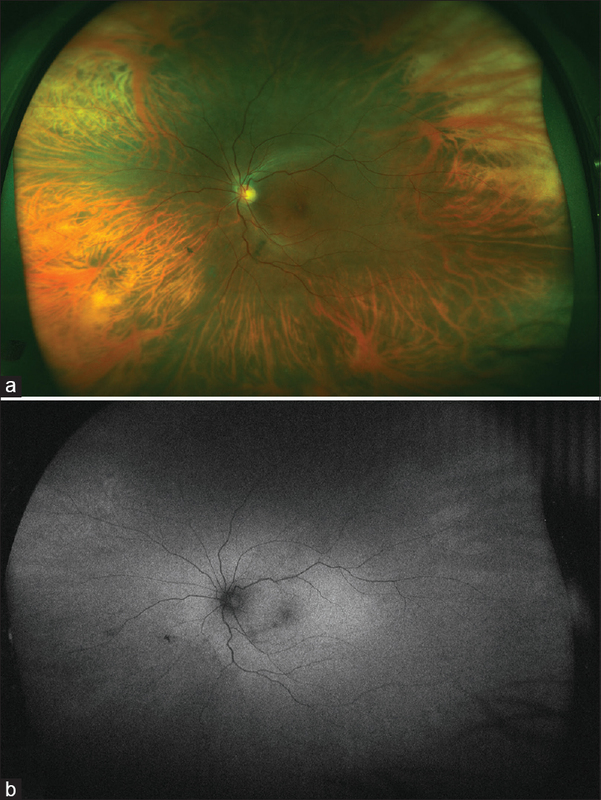 We witnessed a rare case scenario of a 45-year-old female who had a characteristic oblate eye ball (equatorial diameter being more than the axial length) with a rhegmatogenous retinal detachment. Initial preoperative examination of our case revealed marked peripheral chorioretinal degeneration with relatively minimal posterior pole changes. However, the refractive error and the axial length were consistent with mild-to-moderate myopia. We suspected an altered globe morphology in our case following the difficulties faced intraoperatively like maneuvering instruments toward the periphery in the equatorial region as compared to the posterior pole, a poor laser uptake in the periphery due to severe chorioretinal degeneration, and a large amount of silicon oil injected (7.3 ml). A 24.1-mm globe should ideally hold not more than 5–6 ml of oil. This unusually large fill raised suspicion of altered globe morphology denoting elongation in another dimension other than the axial length. To better understand the morphology of the globe, a postoperative ocular USG of the fellow eye was performed. As the operated eye was then silicon oil-filled, its USG was going to have deficiencies/flaws. The fellow eye USG was indicative of the oblateness of the globe. The equatorial diameter was rather high measuring around 26.1 mm when compared to the axial length of 24.7 mm. The maximum axis of the ellipsoid was obliquely extending from the supero-nasal periphery to the inferotemporal periphery. The refractive error confirmed with retinoscopy especially on the left eye showed against the rule astigmatism with the flatter axis inclined toward the supero-nasal direction suggesting lengthening of the globe in that axis. We thus describe a rare case of an oblate globe with a rhegmatogenous retinal detachment. This might be suspected in a patient preoperatively when severe chorioretinal atrophy is visible in the periphery (especially along a particular axis) with a relatively normal posterior pole. Retinoscopy or keratometry showing corneal flattening along the concerned axis may aid in diagnosis. Orbital or ocular USG may confirm the shape of the eyeball. The surgeon might face difficulties in operating on such eyes as explained above and should plan the surgery accordingly. Informed consent was obtained from the patient involved in this case report. Atchison DA, Jones CE, Schmid KL, Pritchard N, Pope JM, Strugnell WE, et al. Eye shape in emmetropia and myopia. Invest Ophthalmol Vis Sci 2004;45:3380-6. Zhou XD, Wang FR, Zhou SZ, Shi JS. A computed tomographic study of the relation between ocular axial biometry and refraction. Myopia updates. Springer, Tokyo; 1998. p. 112-6. Vohra SB, Good PA. Altered globe dimensions of axial myopia as risk factors for penetrating ocular injury during peribulbar anaesthesia. Br J Anaesth 2000;85:242-5. Ishii K, Iwata H, Oshika T. Quantitative evaluation of changes in eyeball shape in emmetropization and myopic changes based on elliptic Fourier descriptors. Invest Ophthalmol Vis Sci 2011;52:8585-91.